The M&G Garden basking in the sunshine. The use of a variety of material brings a warm Mediterrean feel to the garden. The rammed earth wall divides and frames the garden. What a difference a day makes! In 24 hours, with the team working non-stop, the M&G Garden transformation into a Mediterranean inspired landscape is almost complete. As the sun continues to shine, the meadow style planting is ready to glow for the judges. We've been hard at work this week at RHS Chelsea building the M&G Garden with Sarah Price. Luckily the warm, sunny weather has meant we've enjoyed being outside and has made the build easier without rain to contend with! This is particularly important when building the rammed earth walls which require drying time to achieve the right colours for Sarah's design. One of the window-like framing devices from Sarah's design takes shape. Construction work to get the walls in place. 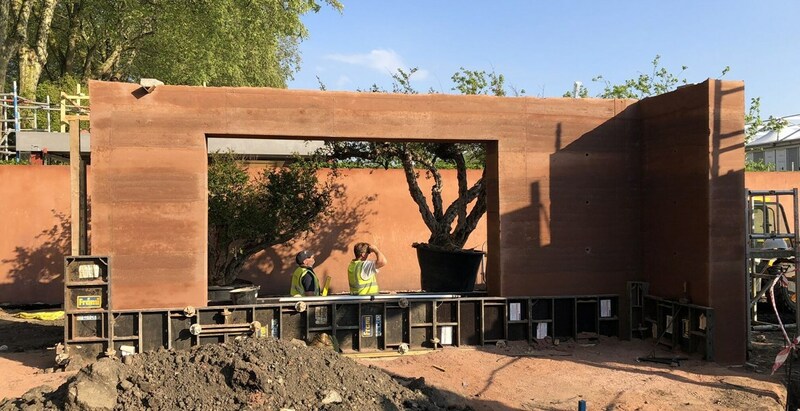 Although we practised building a rammed earth wall back at Crocus head office, we had to rebuild from scratch at the showground so it's a lot of work and complex so a little nerve-wracking for the team. The rammed earth walls are 3 metres high and as there are several of them, it's a big team effort to construct them in time. Sarah Price and the team discuss next steps in the build. Beautiful wisteria ready to be installed. The warm, sunny weather has really helped with drying out the rammed earth walls ready for next week. 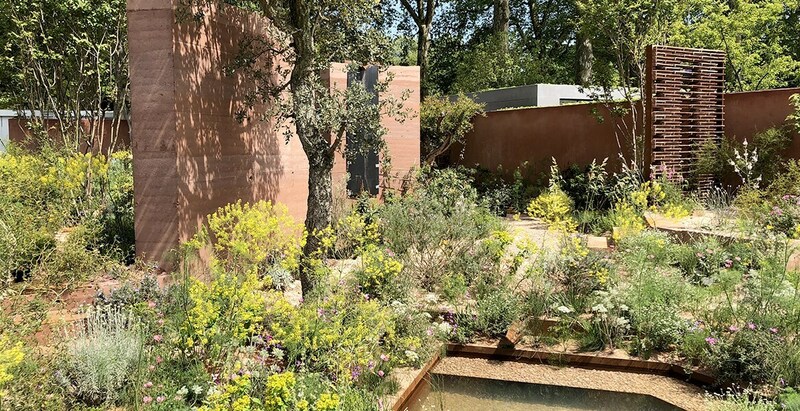 This month we've returned to the Chelsea showgrounds and RHS Chelsea Flower Show to build the M&G Garden, designed by the talented Sarah Price. We've been on site for just over a week and the dry weather has really helped with the construction of the rammed earth walls. At nearly 3m high, it's a complex construction especially with the large opening in the centre. It's the 1st time we've ever built a rammed earth wall so it was a nervous moment when we took the shuttering off! The next few days will see the rest of the walls being built. On Sunday, Sarah will start the planting with the aim to have everything finished by Friday 19th May when the judges come round. Sarah’s design aims to invoke a peaceful, dream-like haven that’s inspired by Mediterranean landscapes. The planting style is meadow-inspired with deep punctuations of colour and exaggerated layering to create variations in height. 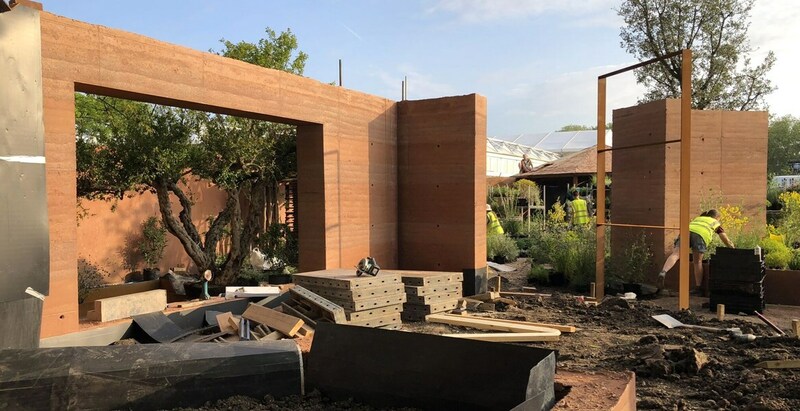 In January, Sarah Price, the designer we’re working with at RHS Chelsea this year, along with Rowland Keable of Rammed Earth Consulting, visited us at the Crocus nursery to experiment with building the structures planned into the show garden design. 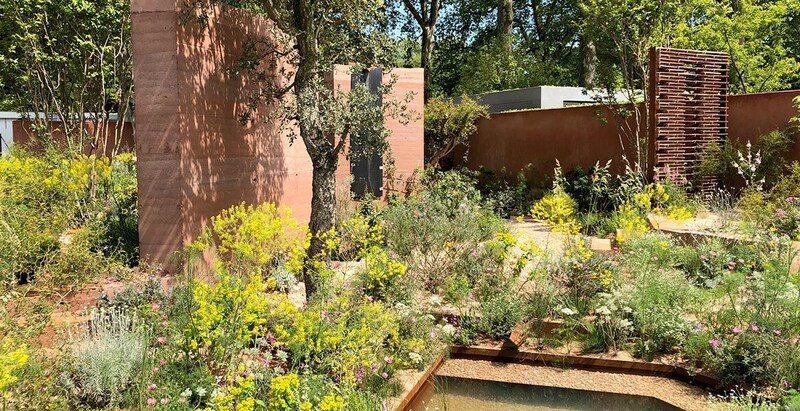 Sarah’s design divides the garden up with walls that act as framing devices and will be constructed using rammed earth which adds warm, earthy colours to the garden’s palette. “Rammed earth is a very ancient form of building. It uses clay to bind together silt, sand and gravel to form dense and sturdy walls from the Great Wall of China to the Alhambra in Granada, Spain. Rammed earth has been used for every kind of building type including garden walls on every continent except Antarctica. With this sample of wall we were looking for the colour variation the designer wanted while using just one clay type which was a deep red. Adding that to different mixes of silts, sands and gravels gave a selection of yellows, oranges, reds and purples. We were glad to get some practice in because the wall we built cannot be transported so we will have to rebuild all over again at the Chelsea showground in May!